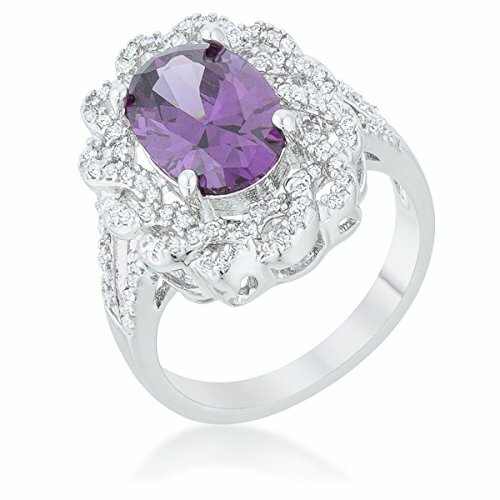 Clear -- finely cut stones twist in an elegant design -- accenting an amethyst center stone in this classic -- 8.5 carat ring. Our genuine rhodium finish is achieved using an electroplating process that coats the item with heavy layers of rhodium -- a close cousin to platinum. This gives our jewelry a platinum luster. Ideal gifts for Valentines Day, Mothers Day, Anniversary Day and Birthday to your girlfriend, daughter, wife and mom. Men's 0.925 Sterling Silver Simulated Sapphire 1.5in Irish Celtic Knot Cross High Polished Pendant 3.3mm Rope Necklace, 24"